What are we doing up here? Blog Day is over. She missed it. She's late for everything! And then she goes and sticks us here for no apparent reason. What is she thinking? Why isn't she posting all those recipes she keeps talking about? What kind of food blog is this, anyway? So she picked up a few bales of hay. That was days ago. She should try laying an egg! Oh no! Do you see what she just said down there? She said "soon." You know what that means. We could be stuck here for weeks! You know what we need? We need our own blog. Definitely. I mean, hens are foodies, too, right? So, do you think cluck.com is available? I think you'd better be quiet before she posts her recipe for curried chicken salad! you definately have to give it up for hens! well spoken. Haha... Those hens look like little characters that actually would say something like that! your comment on my blog was hysterical, thank you! i am also loving your blog, it's fantastic. Too cute - the white chicken looks like one my parents had that wandered around the farm and would chase after cars. I love chickens! my friends' supply me with a weekly treat of golden yloks and lovely zabaglione! Thanks for showing these lovely ladies. And thanks for visiting me on my site--looking forward to more adventures on your farm. Cheers! You are funny and you have a beautiful "feather" according to a French expression which wants to mean : " you have a beautiful writing ". hee hee, the chickens are clucking about susan behind her back. You better discipline them or else you'll get a mini revolution like the chicken run! LOL--this reminds me of one of the girls' favorite books--the cows and chickens revolt against the farmer for some electric blankets. Well, actually, it's the supposedly neutral duck behind everything, but this is getting way too complicated for a kids story. Well done, Susan! I do a curried chicken salad that I'm inordinately fond of. 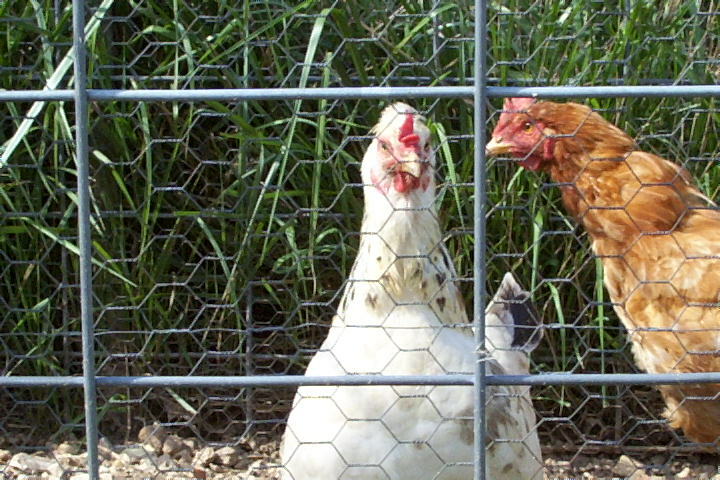 Speaking of chickens and eggs . . . . do you need any egg cartons? I hate to pitch them. Well, I can see whose side you're on. . .
What? You think I wrote that? Welcome to the farm! Thanks for your kind words. So glad I discovered Wake Up And Smell The Blog--you are a riot. Not you, too? Oh, but you redeemed yourself with that sweet feather comment. Thank you. I am guessing that phrase was created when people were still writing with feather pens? Of course, Wallace & Gromit: A Close Shave is my favorite Nick Park film. Somebody involved in the making of that definitely has been around sheep! Mmmm. That does sound good (as does the tuna salad parmesan). Very similar to mine, though I've never added coconut. And you serve it in pita bread! Perfect timing! Oh wait. Was this comment directed at the hens? Welcome to the farm! Thanks for taking the time to write. Yes, that phrase was created when people were still writing with feather pens. Hello FarmGirl: I just mean that the photo gives so much personality to those hens! Farmgirl, I love your sense of "soon"! ...even though it reminds me distinctly of my mother's measurement "some". Me: How much flour do I put in? Me: How much is "some"? Me: Enough?? As in more or less than a cup? Or is it more or less than a dessert spoon? P.S. I admire you for joining in on the BlogDay 2005. When I saw that I had missed it because I too am late for everything, I just rolled my eyes and hoped I'd be in time for BlogDay2006. P.P.P.S. And one last piece of verbosity. Those chickens are wonderful.